A majority of Mexicans still confess a strong devotion to Our Lady of Guadalupe, according to a survey published in the Spanish newspaper, El Pais. The telephone survey by Mexico City pollster Maria de las Heras found 64 percent of respondents “confess a strong devotion” to Guadalupe. Another 40 percent of respondents “profess that they have personally received a favor or miracle” from Guadalupe, de las Heras said. Some 28 percent of respondents reported that they visit the Basilica of our Lady of Guadalupe at least once per year, while a similar number say they visited the site multiple times each year. The survey reflects the enormous influence of Guadalupe over Mexican society. As de las Heras put it: "It's impossible to understand Mexico without knowing Mexicans' devotion to Our Lady of Guadalupe." It also comes on the eve of Dec. 12, when millions of followers converge on the basilica to celebrate the anniversary of Guadalupe’s appearance at Tepeyac Hill in what is now northern Mexico City. Father Jose de Jesus Aguilar Valdes, director of radio and television for the Archdiocese of Mexico City, said that the number of visitors to the basilica has increased over the past year due to the economic crisis in Mexico that has sent unemployment to record-high levels and plunged millions of families into poverty. Local officials in the borough of Gustavo A. Madero - which includes the basilica - estimated that 5.1 million pilgrims visited the Basilica de Guadalupe this year. Catholics believe that Guadalupe appeared before Juan Diego – then an indigenous farmer – at Tepeyac Hill in 1531. Juan Diego was canonized in 1999, although a former rector of the basilica, Guillermo Schulenburg, was against the canonization and didn't entirely accept the story of Guadalupe making an appearance at Tepeyac. He also doubted the existence of Juan Diego. The influence of Guadalupe on Mexican society has been strong for nearly five centuries, however. Her influence extends beyond Mexico, too. Nicaraguan President Daniel Ortega fulfilled a campaign promise to visit the shrine after winning power in 2007. Former FARC hostage Ingrid Betancourt visited the basilica in 2008, saying that she had prayed to Our Lady of Guadalupe while being held in the Colombian jungle. Father Miguel Hidalgo y Costilla, the father of Mexican Independence, was perhaps the most prominent of those leaders; he adopted a Guadalupe banner in 1810 to rally followers to the cause of overthrowing Spanish colonial rule. More recently, the leadership of a union representing fired utility workers adopted a similar banner for its protest marches that attempted to shut down Mexico City. Church leaders in November condemned the use of Guadalupe by any group pursuing political ends. 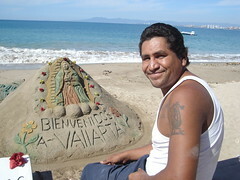 Our course, foreigners also try to leverage Guadalupe's popularity. Then-presidential candidate John McCain made a well-publicized appearance at the basilica during the 2008 election campaign - perhaps an attempt to win favour with Latino voters and shave the rough edges off of a party known for negative views toward undocumented migrants. U.S. Secretary of State Hilary Clinton visited the basilica in 2009 as part of a trip to Mexico that was marked by her insisting that Mexico was not a failed state.